Salvu Sammut's brilliant career was cut short by a fatal traffic accident when he was only 28. The 1931-32 league was not one of the best in the history of the competition. Only four teams took part, two of them from Sliema. The other two were Ħamrun Spartans and Valletta. The interest, however, was still as keen as one would have expected and the competition is best remembered for the fine football displayed, especially by Valletta and Sliema Wanderers. One match stands out from the rest, if only for the great performance produced by Salvu Sammut. The game was that between Sliema and Ħamrun. The Spartans, strengthened by Ġuże Alamango, of Floriana, were routed 6-2. The hero was Sammut. 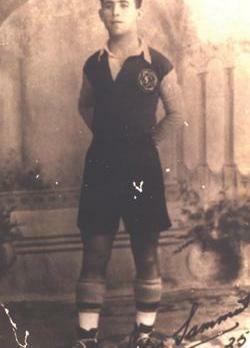 L-Għarawri, as he was popularly known, scored four of the Wanderers' goals. Straight from kick-off he received a pass from Robbie DeCesare, evaded the tackle of two defenders and sent in a great shot past Ħamrun goalkeeper Sanges. Alamango equalised four minutes later but Sliema soon regained the lead. Cauchi released 'Brownie' Sammut who slid the ball first time between Sanges's legs and into the net. 'Brownie' scored again a few minutes later to give the Blues a comfortable 3-1 lead by half-time. The second half was hardly four minutes old when Salvu Sammut beat four challengers and rounded off a brilliant dribble by shooting in via the upright. At that stage Ħamrun pulled back Alamango in an attempt to stop L-Għarawri from doing further damage, but the centre-forward beat Bonnici on the run and once again whipped the ball past the goalkeeper. Ten minutes later Salvu Sammut scored a classic goal to complete his side's 6-1 victory. L-Għarawri was still in the early stages of his brilliant career. Born and bred a few yards away from the St Andrew's FC ground, he was kicking a ball before he could walk. A natural centre-forward, he started his career with Sliema Rovers in the Amateur League. From the Rovers to the Wanderers was only a step away and Salvu soon became the regular leader of the Wanderers' attack. When Tony Nicholl burst on to the scene, Salvu moved to the inside-right position with equal success, forming part of a great trio together with Nicholl and 'Brownie' Sammut. Salvu Sammut was probably the best Maltese product of that era. In that memorable match against the Spartans in 1931, his brilliance was in evidence for the first time, and from then on he never looked back. Greatness is a word used loosely in football but there is no other word which can describe this highly-gifted player. Mention of Salvu Sammut inevitably brings to mind a happy period in the history of Sliema Wanderers. The immediate pre-World War Two period belonged to the Blues and to the most formidable inside trio in the history of the game in Malta. L-Għarawri, Nicholl and Brownie combined between them wits, guile, dash, speed, nippiness and devastating shooting power to set up the highest ever record of goals by an inside trio in Maltese football. Sammut had a charming personality both on and off the field and he was admired by one and all. In football, however, there is very little room for niceties. His deadly dribbles often led to hard knocks. However, he gave as much as he got if not more. Throughout his career Sammut spent just one season away from the Wanderers. That was in 1939-40 when he joined St George's. The Cospicuans still talk of that eventful season when, inspired by l-Għarawri's leadership, they won the Christmas Cup and finished runners-up in the league to revive some of the club's old glory. The outbreak of the war, however, interrupted what could have become a very fruitful partnership between Sammut and St George's. During the war he returned to Sliema to what everyone hoped would be another successful run with the Wanderers... the gods however deemed otherwise. November 1943 was a dark month for Maltese football. On the evening of Thursday, November 11, football fans all over the island were saddened by the news that Sammut had crashed into a car while cycling back from work down Paola hill. He was rushed to Bugeja Hospital in Ħamrun, suffering from severe head injuries. For a few days he fought bravely for his life. At one time he showed signs of improvement but on November 20 there was a turn for the worse and three days later Salvu gave up his gallant fight. 'To me Sammut was the Maltese footballer nearest approaching the David Jack type of player, reliable, constant, rather than brilliant in flashes...'. Coming from such a shrewd judge of football as Hall, this was praise indeed.